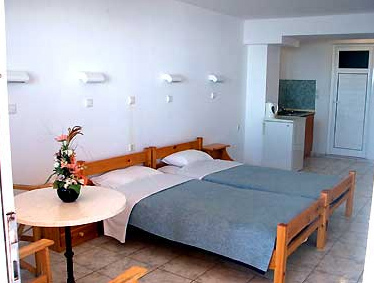 The family run PALM BAY HOTEL STUDIOS is a great base to spend a relaxing holiday, suitable for couples and families. Our hotel is located in the resort of Pefkos on the island of Rhodes, Greece, 4 kms from the historical, beautiful village of Lindos. Pefkos is the Greek translation for Pine trees, which sets the scene for this most beautiful idyllic Greek resort. The beach is situated 100 meters from the hotel. SWIMMING POOL: Our crystal clear fresh water swimming pool has a childrens section, sun terrace with sun beds and umbrellas. Snacks, cold drinks and ice-cream are available at the pool bar all day. RESTAURANT: The poolside restaurant serves breakfast, lunches and evening meals.Homemade Greek and International cuisine.Our famous Greek evening takes place at the restaurant weekly. MINI MARKET: Offering a wide range of food, drinks, large selection of wine and spirits, groceries, fresh bread, cigarettes, souvenirs, cosmetics and beach ware. Daily newspapers and magazines. BAR: Enjoy your drink in the bar of the hotel, with nice music and lovely surroundings. Pool table and games room by the bar. Είστε ιδιοκτήτης ή διευθυντής στο PALM BAY HOTEL; Εγγραφείτε τώρα για δωρεάν εργαλεία, που μπορείτε να χρησιμοποιήσετε για να βελτιώσετε την καταχώρησή σας και να συνδέσετε την ιστοσελίδα σας και το σύστημα κρατήσεών σας.